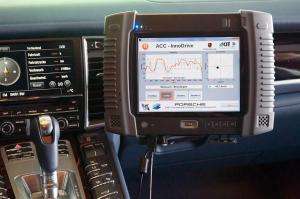 (PhysOrg.com) -- How much of the driving experience are you willing to give up to the computer in your car? Are you OK with cruise control? Anti-lock brakes? Skid control systems? How about taking your feet off of the pedals and letting the car decide how fast you should be going at any given moment, are you OK with that idea? The engineers at the Porsche design team are betting that at least some drivers will be OK with that idea. They are working on a new, more advanced, cruise control system, called the ACC InnoDrive that will make having you feet on the pedals a thing of the past, at least for most of the ride. The system, which is designed with safety and fuel efficiency in mind, works like this. Over time, as you drive to the same places over and over again, you car begins to learn the route and estimates the speed limits, the curves in the road and any elevation changes over the route. It then takes this raw data and uses it to create a trip profile that will do all of the pedal work in getting your from point A to point B. All you have to do is put your hands on the wheel and steer the car. The only question now is how does the car know when the light ahead of you is red? The system is currently in its prototype stages. The system's hardware is currently installed in a Porsche Panamera S. The system does have an off mode for user who prefers to driver his or her own cars. Don't these engineers realize that people who buy a Porsche WANT to drive a Porsche? Whats next- a steak dinner that eats itself? Certainly hope these self-drive computers don't use Windows based software otherwise the 'blue screen of death' could have rather different and literal meaning. to the roadcar, and will one day.